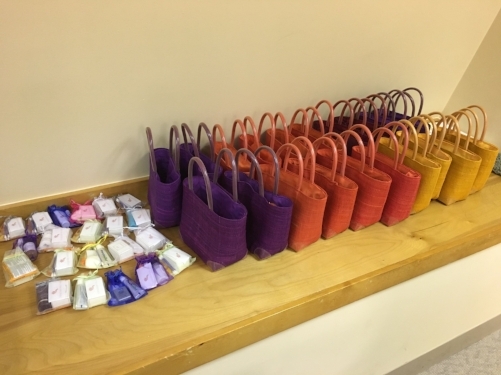 August 15, 2018 - Together She Can dropped off 100 hygiene gift bags to Boston Health Commission's Engagement Center and 100 hygiene gift bags to Rosie's Place. July 1, 2018 - Together She Can partners with Boston Health Commission's Engagement Homeless Center. June 24, 2018 - Together She Can and SEPHORA Prudential Center Boston provide their first Class for Confidence for homeless women of Boston. May 13, 2018 - Together She Can drops off 100 gift bags for the Woods-Mullen Mother's Day Cook-out. May 11, 2018 - Together She Can visits Garnet Hill's International Headquarters where they are proudly begininng their second donation drive. May 8, 2018 - Together She Can and founder, Madeleine Park, are featured by the Boston Voyager. April 30, 2018 - Together She Can partners with Middlesex Community College Class to help bring-in, package, and drop off donations. April 29, 2018 - Together She Can secures partnership with PERIOD MOVEMENT and DIVA CUP to provide re-usable feminine hygiene products to women in need. 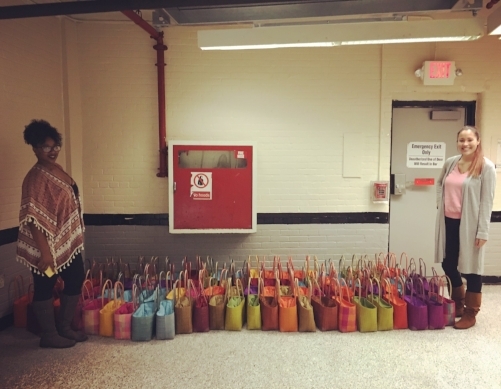 April 26, 2018 - Together She Can donates 200 hygiene gift bags to Woods-Mullen Shelter and Shelter on South Hampton for a community event. April 15, 2018 - Together She Can and SEPHORA Faneuil Hall Boston provide their first Class for Confidence for homeless women of Boston. April 8, 2018 - Together She Can and SEPHORA Newbury Street Boston provide their first Class for Confidence for homeless women of Boston. March 22, 2018 - Together She Can secures partnership with SEPHORA STANDS to provide free beauty classes and products for homeless women in need. March 10, 2018 - Together She Can partners with GIRL SCOUTS OF AMERICA (MASS) to run a donation and gift packaging day. January 30, 2018 - Together She Can secures partnership with GIRL SCOUTS OF AMERICA (MASS). January 27, 2018 - Together She Can and founder, Madeleine Park, featured by Huffington Post and Thrive Global in article, "99 Limit Breaking Female Founders Share Important Lessons They've Learned." January 2, 2018 - Together She Can packages over 1,000 gift bags for "New Year" drop. December 17, 2017 - Together She Can partners with CLOTHES4ALL Boston to "swap" clothing donations for toiletry donations. November 7, 2017 - Together She Can completes life program and purse giveaway at Rosie's Place Shelter. November 1, 2017 - Together She Can completes life program and gift bag giveaway at Women's Lunch Place. October 28, 2017 - Together She Can completes beauty product giveaway at Rosie's Place Shelter and Women's Lunch Place. October 13, 2017 - Together She Can completes life program and gift bag giveaway at Women's Lunch Place. September 23, 2017 - BOLD & BEAUTIFUL WOMEN'S CIRCLE completes city-wide donation drive for Together She Can with help from YMCA and Community Centers. September 21, 2017 - GARNET HILL completes first donation drive for Together She Can. September 17, 2017 - Together She Can completes life program and gift bag giveaway at Women's Lunch Place. September 16, 2017 - Together She Can completes beauty class and gift bag giveaway at Rosie's Place Shelter. September 13, 2017 - Together She Can completes guided meditation and gift bag giveaway at Woods-Mullen Shelter. September 6, 2017 - Together She Can completes beauty program and gift bag giveaway at Rosie's Place Shelter. September 3, 2017 - Together She Can secures partnership with GARNET HILL. August 26, 2017 - Together She Can completed their first life program with a support dog (and gift bag giveaway) at Woods-Mullen Shelter. August 19, 2017 - Together She Can ran their second Beauty & Meditation Day for the overnight program at Rosie's Place. The women received Egyptian Clay face, arm, and hand masks, cookies, and drinks while being taken through a cleansing guided meditation program. All participants received a free purse filled with toiletry items. August 17, 2017 - Together She Can celebrated National Nonprofit Day in Boston. August 16, 2017 - Together She Can ran a Guided Meditation and premium gift box giveaway at the Boston Women's Woods-Mullen Shelter. August 1, 2017 - Together She Can is celebrating their 1 year anniversary! July 29, 2017 - Together She Can ran their second Guided Meditation and gift bag give-away with the Boston Men's Southampton Shelter. July 19, 2017 - Together She Can ran a Guided Meditation and premium gift box giveaway at the Boston Women's Woods-Mullen Shelter. July 15, 2017 - Together She Can ran their second Beauty & Meditation Day for the overnight program at Rosie's Place. The women received face masks, chocolate covered strawberries, and drinks while being taken through a relaxing guided meditation program. All participants received a free purse filled with toiletry items. July 15, 2017 - Together She Can purchased a photography book for a homeless women who is interested in a career in photography and the arts. July 15, 2017 - Together She Can ran a Skill Building & Guided Meditation Class for women at Women's Lunch Place to help with their résumé building and job search. All participants received a free gift bag filled with toiletries. July 1, 2017 - Together She Can secures partnership with BOLD & BEAUTIFUL WOMEN'S CIRCLE. June 30, 2017 - Together She Can is working to reunite an elderly homeless women with a family member who is currently living across the country. Our team was able to find the family member via social media and is setting up a time for them to speak. Together She Can and Eliot Chuch of Roxbury have offered to sponsor her in an day center program. 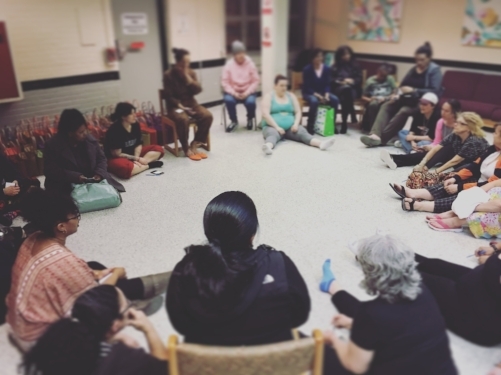 June 29, 2017 - Together She Can ran a Guided Meditation and premium gift box giveaway at the Boston Women's Woods-Mullen Shelter. June 24, 2017 - Together She Can ran their second Guided Meditation and gift bag give-away with the Boston Men's Southampton Shelter. 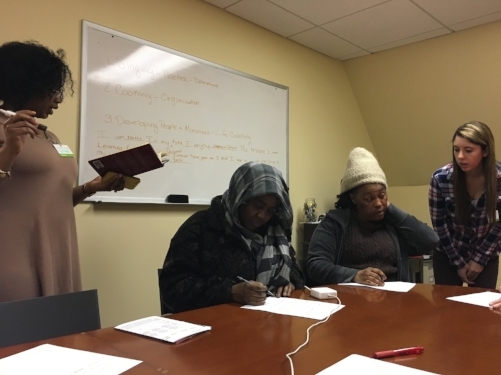 June 10, 2017 - Together She Can ran a Skill Building & Guided Meditation Class for women at Women's Lunch Place to help with their résumé building and job search. All participants received a free gift bag filled with toiletries. May 14, 2017 - Together She Can donated 200 purses filled with toiletries to Women's Lunch Place for their annual Mother's Day brunch. May 10, 2017 - Together She Can was attended the Friends of Boston's Homeless 2017 Gala. April 27, 2017 - Together She Can sponsored the Woods-Mullen Fashion Show presented by Boston Volunteer Services Department. The Fashion Show was created to, "help clients build confidence and self-esteem through encouragement and self-awareness. To promote a partnership between guests and staff." April 26, 2017 - Together She Can provided their second Guided Meditation Program and gift bag give-away to the women of the Woods-Mullen shelter. April 12, 2017 - Together She Can launched their Grab n' Give program. This program allows companies to have TSC gift bags onsite for their employees to hand out/carry with them. 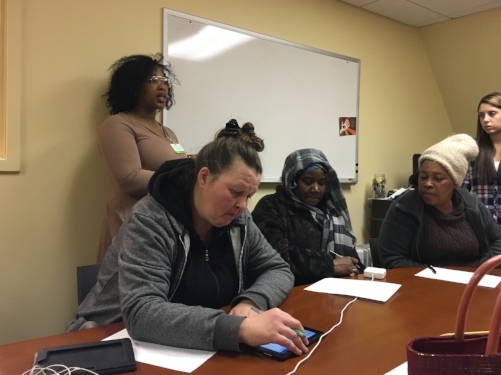 This program was created to help alleviate pressure felt by employees to give money or other items to those experiencing homeless around their workplace. April 1, 2017 - Together She Can provided their first-ever life program at Boston Health Commision's Men's shelter. Each of the 25 participants were able to share their stories, meditate, and receive a gift bag filled with hygine supplies and socks. March 19, 2017 - Together She Can was honored by Eliot Church of Roxbury at their annual Women's Day service. March 18, 2017 - Together She Can provided a Digital Presence program at Women's Lunch Place. Participants learned how to leverage their skills using digital media and received gift bags. March 1, 2017 - Together She Can started their Snowy Hearts Project. Winter is the toughest season for the homeless communities. Snow covered grounds and freezing temperatures can cause extreme harm to the human body. We added hand warmers and foot warmers in our gift boxes to help keep our community members healthy and warm. 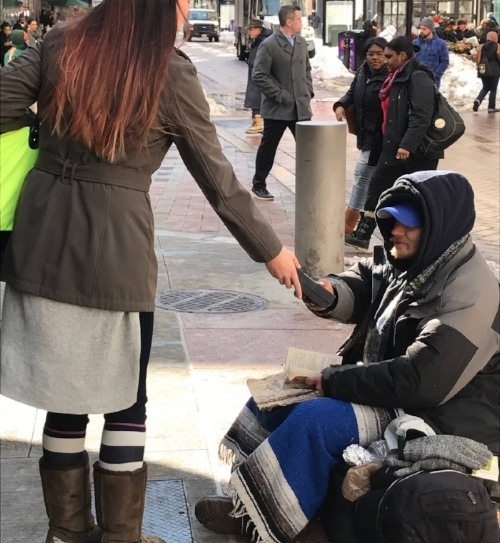 February 14, 2017 - Our team walked around downtown Boston and handed out Together She Can premium gift boxes to those in need. It was a wonderful day filled with love and hope.